Bentley’s next Flying Spur will be reinvented as a much more distinctive luxury saloon in 2019 and will be the last Bentley to be launched before the company completely reinvents its cars for the era of electrification. 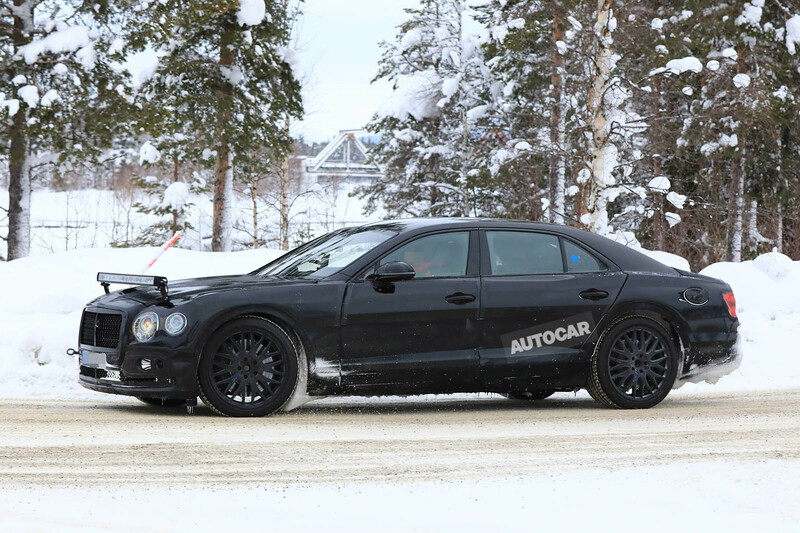 The four-door Flying Spur will be Bentley’s answer to the likes of the Rolls-Royce Ghost and Mercedes-Maybach S600. It will begin a shift in style away from the Continental GT (although the two cars will continue to be closely related under the skin) and bring the curtain down on Bentley’s current era of design before an all-new look for the firm is introduced, most likely on Bentley’s first electric model. Design work on the Flying Spur – and, indeed, the entire Continental family of models – has long been completed. The Continental GT coupé unveiled at last year’s Frankfurt motor show and the Continental GTC cabriolet, which is set to be the second member of the family to be launched later this year, were designed alongside one another, with the Flying Spur following close behind through Bentley’s design studio. Autocar understands the Flying Spur’s body styling follows the themes of the Continental GT but has more distinct surfaces and sharper swage lines, something that’s traditionally been a challenge with aluminium body panels. Bentley is understood to have put far greater visual differentiation between the Flying Spur and the Continental to make more of it as a model in its own right. This follows a process started on the outgoing Flying Spur: whereas the original car featured the word ‘Continental’ as a prefix, the current Mk2 version did not. The Continental GTC, meanwhile, will share its front end and doors with the coupé but have a different rear-end design to accommodate a retractable fabric roof. A full range of engines is expected to be launched on the next Flying Spur, including Bentley’s V8 and W12 petrol options, and a plug-in hybrid based around a V6 petrol engine instead of going down the diesel route. Hybrid options will be key in bolstering Bentley’s sales in China in particular. In time, a Speed variant will crown the range. It will feature a higher-performance engine that will also be used in the Continental GT and GTC. Once the Continental range has been completed, the firm will turn its focus to what Autocar understands will be a next step in its design, promising a more radical change to something more fresh and modern. Bentley is known to be considering a fourth model line, on top of the Continental GT/GTC/Flying Spur family, Mulsanne and Bentayga, although officially all plans are on hold after the recent arrival of new boss Adrian Hallmark from Jaguar Land Rover. No future Bentley beyond the Flying Spur has been formally signed off for production. The favourite, however, is understood to be an electric car based on the Porsche- developed J1 platform, which is being introduced on Porsche’s first dedicated electric car in 2019, codenamed Mission E. Bentley’s EV, which would bring with it a new nameplate to the range, would be a sleek four-door, halfway between a 911 and a Panamera in size but pitched more towards the former in terms of driver appeal. A car of that size is believed to hold great appeal to Bentley, and was the favoured choice under recently departed boss Wolfgang Dürheimer, instead of two other options on the table: a smaller sports car inspired by the Speed 6 concept of 2015, and a smaller (and therefore less profitable) SUV to sit below the Bentayga in the range. At least one other electric Bentley could follow, possibly a reinvention of the Mulsanne flagship complete with a new model name. In addition to the stand-alone pure electric models, Bentley will have an electrified version of every model in its range by 2025, including plug-in hybrid variants of the Continental family and the Bentayga. What's that weird bonnet bar thing? It's an LED lighting bar. It looks good, better than a RRoyce...? Oh you are funny, they use VW engines ffs, Bentley dont make their own engines, and the best selling Bentaga is a diesel which means the best selling Bentley is a diesel, but its not really a Bentley, its an Audi in a very expensive frock. Ah, the 2010 Benamera. I'm sure it will be crull. Bentley's bulk-reducing programme is to be applauded, but on the evidence of this sketch there is still some way to go to match RR Ghost's serene elegance and formal confidence. The grille looks like it's slipping off the front of the car. It ruins what's an otherwide great looking shape. I love the Coke bottle shape, like an updated Mk3 Cortina only a wee bit bigger and a tiny bit more expensive.